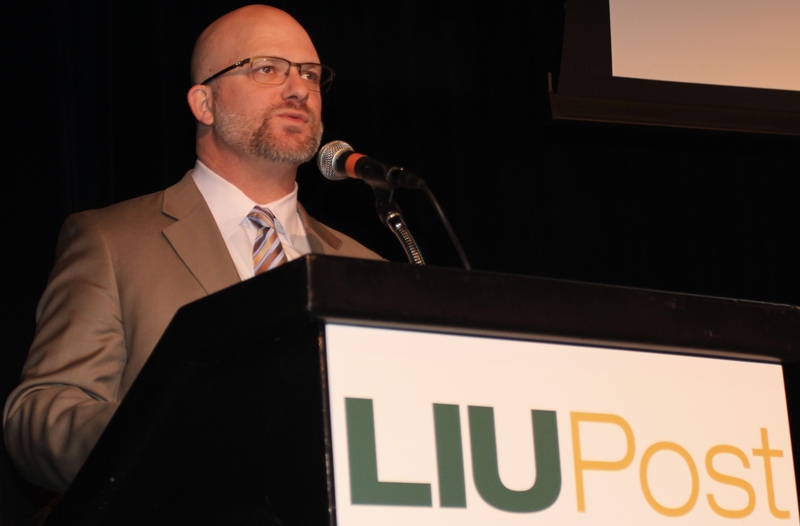 Dr. Timothy Eagen, superintendent of the Kings Park Union Free School District, presented the next steps in a regional college readiness initiative at a forum held at the Tilles Center at LIU Post. Helping today’s high school students make a smoother transition to the rigorous demands of higher education was the focus of the Superintendents/College Presidents Partnership Regional Forum held at Long Island University’s Tilles Center on Nov. 28. 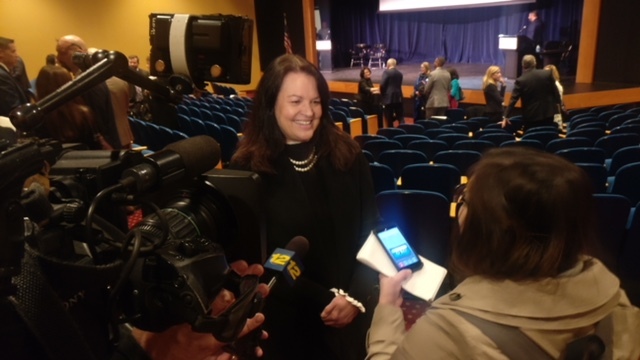 Almost 150 high school superintendents, principals and guidance counselors joined Long Island’s college presidents and administrators to hear concrete suggestions on how they can improve college readiness at the high school level. The participants were greeted by LIU President Dr. Kimberly R. Cline, co-chair of the SCPP steering committee, who praised the hundreds of hours the volunteers had devoted to studying this important issue. 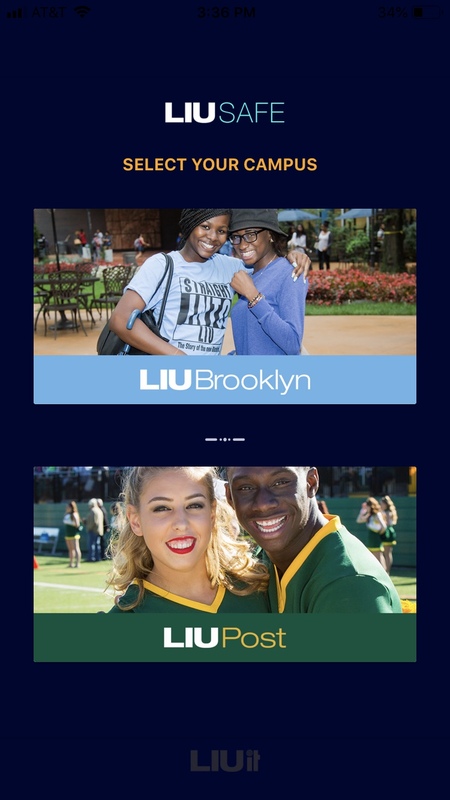 The SCCP is a work group formed in 2001 of the Long Island Regional Advisory Council on Higher Education (LIRACHE), which is a non-profit consortium of 15 colleges and universities, representing more than 178,000 students and more than 33,000 employees. The Partnership is uniquely focused on matters related to teaching and learning on Long Island, from preK-12 and beyond. The forum presented the results of three work groups that had handled the areas of counseling/advising, mathematics and writing skills. “While academic skills are clearly important, social and emotional factors—the non-cognitive and meta-cognitive skills—are actually quite powerful when it comes to college readiness,” said Dr. Rachell Germana, interim assistant provost for academic success, division of undergraduate education, Stony Brook University, who co-chaired the first work group. She called for getting parents more engaged as effective partners in their children’s long-term success, preparing them for the “college mindset”—as she put it—as well as helping them choose what college to attend. Dr. Timothy Eagen, superintendent of Kings Park Union Free School District, who co-chairs the SCPP steering committee, discussed what his working group on mathematics had recommended. “Our students rely way too much on their calculators,” he observed. He pointed out that under New York State rules, high school students are required to take only three years of mathematics, and as a result many seniors in high school skip math only to wind up in worse shape when they get to their first year of college. When it was her turn to speak, New York State Education Commissioner MaryEllen Elia praised the work done by LIRACHE in creating SCCP. They all agreed that there is much more work to be done. LI President Dr. Kimberly R. Cline, co-chair of the SCPP Steering Committee, spoke about the forum’s findings to Newsday.